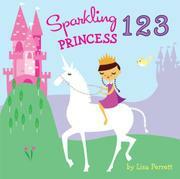 Count up to 10 with various fairy-tale characters. Bedecked in foil of various hues with a subtle embossing, 1 frog prince, 2 glass slippers, 3 castles and 4 unicorns all make an appearance. Most of the objects are easily counted, but the “10 enchanted friends!” prove confusing; is the princess atop the unicorn an enchanted friend or is it the barely visible snail resting on a sparkly mushroom? A few of Perrett’s graphic cartoons in highly saturated jewel tones are droll, but readers may start to wonder why so many of the people and the magical beings never open their eyes. While a token few of the princesses here show some ethnic variety, the sister title, Sparkling Princess ABC (2013), does a better job with diversity and depicts a dark-skinned princess on the cover and two more on the inside. Working through the alphabet, several of the same fairy-tale characters cross over to this book and are again embellished with the same speckled foil. One-word captions label each object, which are depicted two or three to a page. At the end, both titles unnecessarily review the numbers and letters in a too-busy double-page spread with tiny images.